Gold prices remained above the $1210 level overnight but the metal was as yet unable to add significant amounts to Tuesday’s Portuguese downgrade-induced gains as rising overseas equities markets and a rebound in the euro capped advances. Indian buyers remained on the sidelines as shopkeepers reported no changes in pending orders for bullion purchases from would-be buyers under the $1190 value zone- the very price neighborhood from which the yellow metal rebounded recently. Should assaults on the $1220-$1235 region fail to be successful, such buyers may yet see their orders filled. On the market and economic fronts, the euro eked out further gains following yesterday’s early dip and rose to above 1.27 against the US dollar this morning. The latter remained largely static at lower levels and was last seen at the 83.50 level on the trade-weighted index. Crude oil also remained stalled and showed modest declines towards the $77 per barrel mark after reports revealed a gain in US inventory levels. Earnings reports remain at the centre of this week’s equity markets’ focus and a second bellwether firm –Intel- announced solid results. Market players now await US retail sales data and the release of the last Fed meeting’s minutes. Less than encouraging news continues to come in from the real estate sector in the US however; mortgage applications to purchase new homes fell to a fourteen-year low as the end of the home-buyer tax credit incentive took its toll. The majority of applicants for loans were people seeking to refinance instead. Industrial output in the eurozone continued to show gains-albeit lower than expected ones- with the latest report indicating a 9.4% rise in the year-on-year figures for the month of May. Germany remains the look-to country in the 16-nation economic zone and it is seen as the core of growth as well as the patron saint of the recently beleaguered common currency. In fact, the country has every incentive to help keep the euro alive as it continues to benefit from its exports to the region while helping keep domestic unemployment and near two-decade lows. Pundits calling for the demise of the euro –now that the single currency has actually gained 6.6% against the greenback during just the past month- have an amount of egg on their respective faces just as large as that which was present when the US dollar failed to succumb and be buried late last year. In other ‘too-soon-to-call-this-one-dead’ news, banking giant UBS this morning backed away completely from its recommendation to short the British pound. Spot precious metals dealings opened the midweek session with growing losses following a stable overnight period, as the Tuesday recovery rally appeared to lose steam on waning safe-haven demand. Fear has been slowly but surely leaking out of the gold market since the metal reached an all-time pinnacle last month. 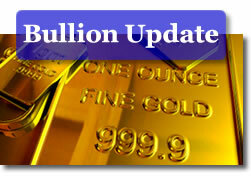 Spot gold started the day with a $4.50 drop and was quoted at $1206.80 per ounce. Silver fell 14 cents to open at $18.11 the ounce. Meanwhile, platinum and palladium only showed minor price negative trends as well, with the former shedding $6.00 to $1519.00 and the latter slipping $1.00 to the $463.00 level. Rhodium remained at $2380 after having shed $30 in the previous trading session. IB Times reports that the surplus in the palladium market is set to shrink by 62 percent in the current year (to 217,000 ounces), while platinum’s is likely to increase a bit further. At the end of the [trading] day, the recent trading ranges remain in place for the complex –especially gold– as price supporters and profit-takers duke it out each time gold reaches for either extreme of the charts (near $1185 and/or near $1220). In ‘signs of the times’ news, Bloomberg reports that the common man is donning the rugged outdoor gear last seen during the Klondike gold stampede and is heading for "them thar’ hills" in search of riches. While shovels and picks are still available at your neighborhood Home Depot, the rush to dig gold out is as fevered as the shrill talking suits on financial channels calling for a moon landing in gold prices. Membership in the Gold Prospectors Association of America has exploded with a 93% gain in 2008. That’s some 62,000 diggers, folks. Even if they only find less than an average of $50 per day of hard work out there. Well, at least there’s fresh air and a fresh tan to enjoy while standing in freezing river waters all day. Comparisons with the Internet mania of the late 90’s and/or the real estate frenzy of not too many months ago are inevitable. Searches for ‘mining claims’ on eBay yield results that offer ones selling as high as $50K. Of course, one can buy a claim even for a buck — even those come complete with keywords such as ‘secret location’ or ‘unexplored treasure trove.’ Think we’ll stick with selling shovels…after all, with nearly 24,000 claims being on file with the California BLM office alone, there should be plenty of demand. The new 49ers are not down at Candlestick Park. They’re up in Yreka. Unfortunately, there is also another, much darker side to the New Gold Rush. Not everyone is content to swirl mud in a large pan in the Sierra Nevadas. Even that hobby is claimed to have completely upset the ecosystem that river salmon live in that picturesque region. Let’s take Colombia, for example. It has recently acquired (according to the UN) the dubious distinction of having become the planet’s number on mercury polluter. Several of the country’s regions have reported mercury levels some 1000 times higher than what is deemed acceptable by the WHO. Nearly 50 tonnes of mercury are estimated as being released in just five of the largest gold-mining towns in the country on an annual basis. The cost? How about one Colombian town –Remedios– where at least one kidney transplant per month is the price being paid for coming in contact with mercury vapor? Not to mention memory loss, ADD, speech impediments, and severe chronic head ailments. More than 40 firms are known to be digging for gold in the country and the production of the yellow metal is forecast to boom to nearly 100 tonnes per annum soon. Peter L. Bernstein, the author of "The Power of Gold" once said: "It’s never been clear if we have gold or if gold has us." One of these days, if you are really curious as to what the real price of gold is, go visit the National Geographic website. At http://ngm.nationalgeographic.com/2009/01/gold/larmer-text you will find an expose on just that topic. Hint: it is not a dollar figure. "No Blood Diamonds" is a slogan for the times. Perhaps "No Dirty Gold" should have an equal billing, five years after the establishment of the organization bearing the same name. After all, how many gold buyers are aware that a single wedding ring’s production entails the generation of 20 tonnes (that’s 44,000 lbs.) of waste? In addition to bullion American Silver Eagles that are already available, the United States Mint this year will also issue .999 fine bullion National Park 5 oz. Silver Bullion Coins that are duplicates of the America the Beautiful Quarters. The first of five coins will be released this summer, with the remaining four to follow in short intervals. Check this America the Beautiful coins releases date link to visit a sister site to CoinNews for more information on when each of the new coins will be issued.